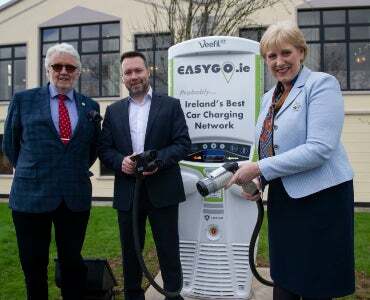 Monaghan, Ireland, March 26, 2019 – EasyGo.ie, Ireland’s first privately-owned electric vehicle (EV) charging network, yesterday unveiled Ireland’s most advanced, publicly-available DC charger at the Four Seasons Hotel in Monaghan. EasyGo.ie has deployed a Veefil-RT 50kW DC rapid charger from world-leading DC charging technology specialist, Tritium. The successful installation marks the first deployment of a rapid charger in Ireland on a new site in some time, and the first deployment of a 50kW DC public charger on a private network in Ireland. The charger, the most advanced of its kind with the smallest physical footprint in the world, can add 50 kilometres of range to an electric vehicle in just 10 minutes. The charger was unveiled at a ribbon-cutting ceremony at the Four Seasons Hotel in Monaghan yesterday afternoon. “We’ve always strived to serve the present and future needs of our customers by staying ahead of the curve, and the world is trending closer towards a zero-emissions, electric vehicle future,” said Frank McKenna, Director, Four Seasons Hotel Monaghan. “We worked with EasyGo.ie to install the charger at our site because we want to cater to EV owners who will need to charge their vehicles not only quickly, but in comfort and style; while their car charges, they can avail of all the facilities that the hotel has to offer. The Ceremony was attended by Minister for Business, Enterprise and Innovation, Heather Humphreys T.D. “It’s been proven time and again the world over that the installation of publicly-available rapid charging options leads to greater EV uptake,” said Kevin Pugh, Business Development Manager for Tritium, UK and Ireland. “With EasyGo.ie planning to install chargers at 88 sites in two years, you’ll start to see a noticeable increase in EV adoption and this will have a major impact in helping Ireland achieve its climate change goals. “Ireland is experiencing challenges in meeting its climate change targets with the prospect of paying substantial fines. As a sector, we recognise that we can be part of the solution and many hotels are already making substantial efforts to further improve their sustainability,” said Lennon. “The IHF is taking an active role in this area and has formed a Sustainability Committee to develop new policies, practices and initiatives to help our industry play its part. Founded by Gerry Cash and Chris Kelly, EasyGo.ie is a leading independent Car Charging Operator in Ireland. The charging network is used extensively across Retail, Workplace, Hospitality and Public Sectors and enables users to pre-book charging sessions to be sure the charger is ready, free and awaiting their arrival. We work with business owners, property developers and site managers to ensure appropriate and cost-effective charging solutions can be put in place to meet both present and future needs. We provide a full charge point installation service together with consultation and supervisory support. EasyGo.ie chargers are monitored 24/7 and with a round the clock public call centre, we ensure drivers are always getting the best charging support available. The four-star Four Seasons Hotel, Monaghan is a family run independent hotel located 1km from Monaghan Town. It first opened its doors in 1970 and has continued to grow ever since. In the almost 50 years in business The Four Seasons has always striven to provide the best service, and recently won another award for “Customer Service Excellence” from Bord Failte. Tritium is a technology company that designs and manufactures the world’s most advanced DC fast-charging equipment for electric vehicles (EV). Established in 2001 to provide power-electronic systems and battery energy-storage applications, Tritium became one of Australia’s fastest-growing companies with the launch of its first DC fast charger in 2014. Since then, Tritium has become a leading global DC fast charging (DCFC) supplier with installations in more than 29 countries. Tritium currently holds around 50 per cent of the world-leading market in Norway and around 15 per cent of the wider global market for 50kW fast chargers. Tritium customers include Charge.net.nz, EDF Lumins, Fortum, Grønn Kontakt, IONITY and Stromnetz. Tritium’s global headquarters and main manufacturing plant is in Brisbane, Australia. Additional sales and manufacturing facilities in Amsterdam and the Los Angeles region ensure attention to key markets in Europe and the Americas.